MonoDAQ-U-X is a Universal 16-bit galvanically isolated USB DAQ Device specially designed for IoT development. It features a configurable front-end with 1..24 V @ 1 W supply, 50 kSa/s alias free voltage sampling in ranges from +/-100 mV to +/-10 V, currents, strain-gauge, thermocouples, digital inputs, and more. MonoDAQ is an USB Full-Speed 500 mA Plug and Play device providing up to 8 multiplexed voltage inputs from +/-100 mV up to +/-10 V and one current input up to +/-500 mA. To extend a number of channels, MonoDAQ can easily scale and fully synchronize its operation via USB. MonoDAQ talks in Open ISN language and is fully supported by IDM, python API and jupyter. Plug in your MonoDAQ, click on Devices and go to USB devices; you should see it displaying its version and up-to-date status. Double clicking on the MonoDAQ-U-X device opens the so-called Device View window in Basic View. For MonoDAQ-U-X this page is also called Channel Setup view. By default, MonoDAQ-U-X presets one voltage channel at the maximum rate. The user can start reconfiguring the channels by simply clicking inside that content. Everything in blue is clickable. MonoDAQ-U-X will automatically adjust the rate settings or voltage ranges if the desired configuration conflicts with the other settings. During re-configuration you may also check the very top line informing that module = System is state = Ready, which reports the current progress. The measurements are shown in the value column and are updated in real-time. The parameter Tab shows all of the device parameters structured in a tree, with additional information, such as precision, uncertainty where given, unit and time stamp of the last update received. 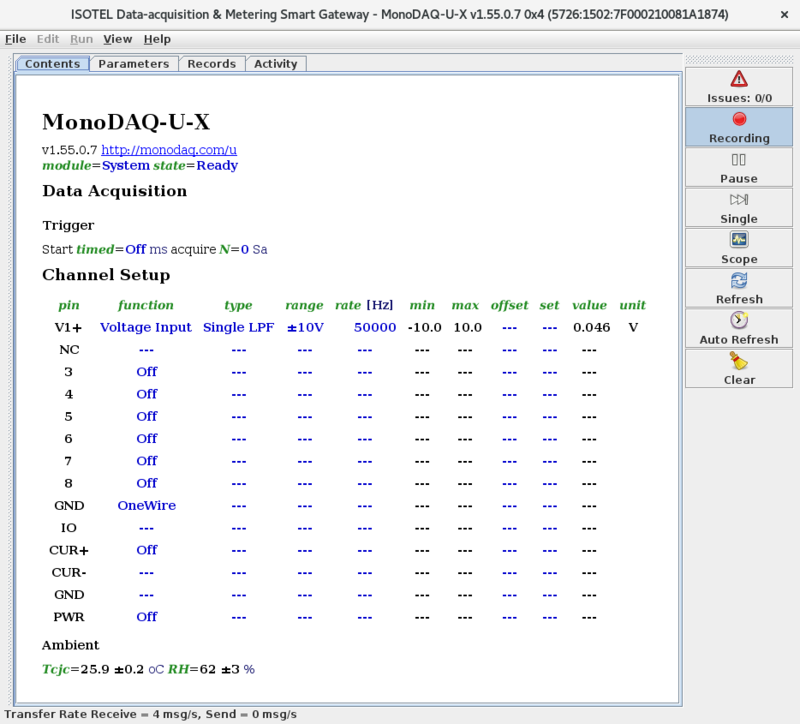 IDM stores everything it receives from MonoDAQ-U-X by default, except the streaming samples. The history of these records can be browsed under the Records Tab. If an error occurs, the MonoDAQ-U-X title turns red and the Issues button displays the number of errors. Clicking on it will highlight the parameters that reported a problem. For a deep diagnosis, the user may need to change the Basic View into a more detailed view, which can be done in the View menu. IDM can run as a deamon on Raspberry PI, NAS or other systems supporting java. The status reporting integrates with a standard syslog and IDM also starts Web API by default. 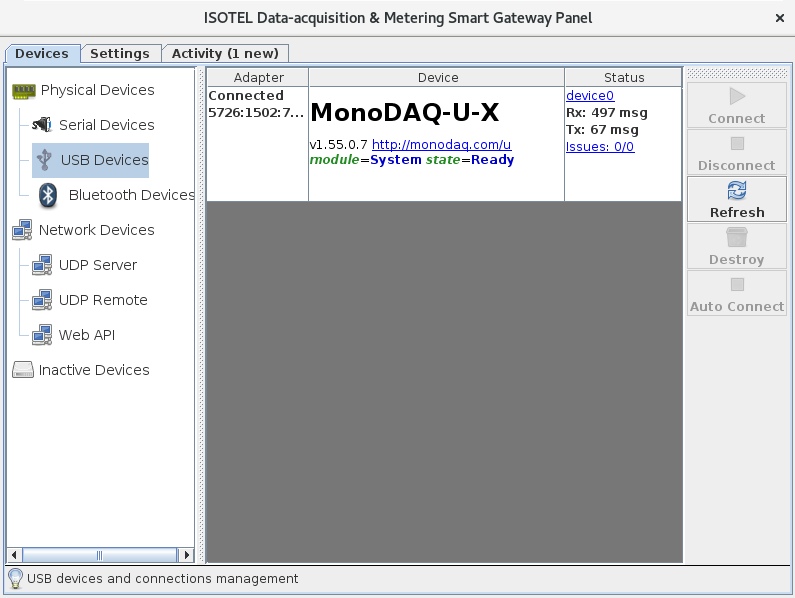 By visiting the web view app at http://www.isotel.net you can easily access MonoDAQ-U-X, monitor and control it remotely. All the information from the Channel Setup is recorded, meaning that the web view app offers a simple way to plot temperatures from thermocouples, or other channels, by simply clicking on a parameter and adding it to the chart. to get full MonoDAQ-U-X support. Learn more under IDM Python & Jupyter Support. run it as a real-time scope with a rising edge trigger. In this demo we shall activate an analog, a digital one and a PWM channel, then wire the PWM output (from pin 4) back to the digital input (pin 1). First we call the reset() function to begin from the start, then we configure the channels, and print out the configuration. The configuration could also be stored in a 1-wire memory attached to a connector that is automatically reloaded when the connector with such a memory is detected. 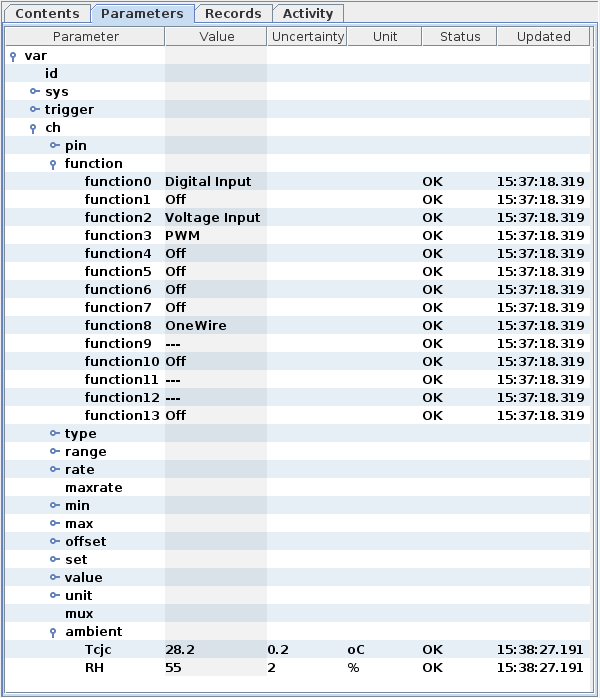 When directly accessing the parameters, you may want to use the Parameters view of the IDM, which will help you browse through the device data structure. The generator provides meta information on the channels in the first line (row). In order to fetch the values, the generators need a sink, which loops over all the entries. In our example, we simply use the list() as the sink to display values. The fetch() method outputs a stream. To be able to plot it, the stream must be collected into a signal. A signal here means a dict sorted by channels, each having a pair of lists of equal size, providing Y samples and corresponding X time samples. To convert the generated output to a stream use the signal.stream2signal() method, which is a generator returning signals. Now to the plot, with the signal.scope() which iterates over signals provided by the stream2signal() method and returns last acquired signal as data. Let us increase the number of samples to get a nicer waveform. It would be a pity not to be able to perform a real-time analysis or computation on data in python. We mute the first V1+ [V] channel and change the colors of the other two. You may freely enter an equation with channel names with big capital letters, and only up to the + sign or space. Real-time updates require that a larger continuous stream of samples is fetched from the MonoDAQ. We achieve that by providing fetch(2000000) a sufficiently big number to run for some more time. 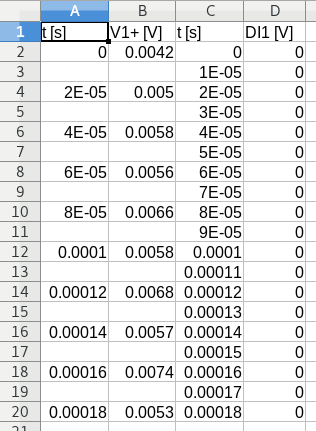 To display the intermediate collected samples, we need to instruct the stream2signal() a split parameter with a number of samples to be displayed in one shot. Note that fetch() refers to analog samples and there may be a significantly larger number of digital samples at the output. In addition if you want, you can reset the time and start at zero each time a shot is made. Then you should set the relative_time to True. Trigger is set a single_shot mode by default. The example below shows how to wait for a rising edge on the DI1 digital channel by specifying both the pre-condition and the condition. When the condition triggers, P pre-buffered samples are yielded and then continues for the remaining N samples. To fetch 10 samples and print them on screen. Note that the t character may not perfectly align the spacing between the numbers, however the single t simplifies parsing and importing into LibreCalc or Excel. To redirect them to a file add > file.tsv at the end. However you can combine the IDM Web View (http://www.isotel.net) to configure and review the Channel Setup with the CLI to fetch samples into TSV formatted file. Note that if your IDM is configured in non-TLS mode, then the the isotel.net must be also open in non-TLS the http://… mode and not the https://… in order to be able to access MonoDAQ-U devices.